Luck is a loser’s excuse for a winner’s hard work and position! 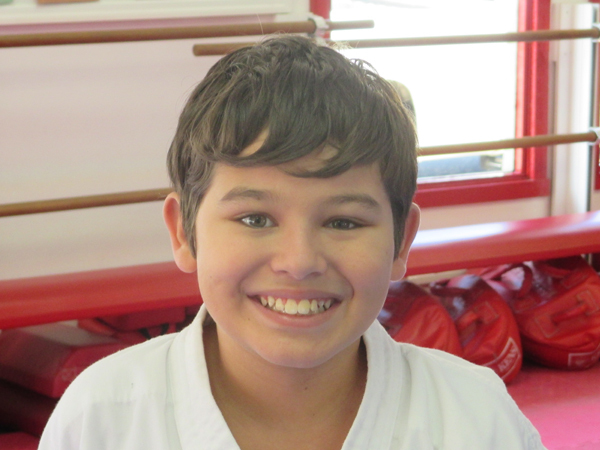 Chase joined our Black Belt school in September of 2014. Currently an Orange Belt, Chase is well on his way to Black Belt excellence. Always a smile in class, Chase can be counted on to add enthusiasm and fun to very class. Besides the normal training of class, Chase really enjoys sparring and is getting much better at it. When asked to help in class Chase shows ability far beyond his years. Sifu Rick would like to salute Chase’s parents, Scott & Michelle, for not only their support of Chase in his training, but for our Black Belt school as well. We all know that we should be making smart choices when we shop around for the right foods to support our health and vitality. Your body is a machine that runs best on quality fuel — here are some tips on keeping your engine in tip top shape! Avocados are rich in monounsaturated fats and vitamin E, both of which support healthy skin. Try them on salads, sandwiches, and even in smoothies. People who stick to diets that are rich in potassium may be less prone to high blood pressure. Besides reducing sodium and taking other heart-healthy steps, eat potassium-packed fruit such as bananas, cantaloupe, and oranges. Adding raw or lightly cooked garlic and onions to your meals may help keep you healthy. Garlic has antiviral and antibacterial properties and is believed to boost immunity. It improves oral health, promotes weight loss and provides energy. Studies show drinking water raises alertness. Next time you need an energy boost, skip the coffee and energy drinks and take in that H2O. Hot or iced, green tea is loaded with antioxidants and nutrients that have powerful effects on the body. The benefits include but are not limited to: improved brain function, increased metabolism, and a possible lower risk of cancer. Good fat and fiber in the morning means less hunger late in the afternoon, when you’re most likely to feel tired and binge on simple carbs and sugary sweets. An early start on eating also keeps your metabolism more active throughout the day. Try steel cut oatmeal, farm fresh hard boiled eggs with some whole grain toast or a fresh fruit smoothie. They are rich in omega-3 fatty acids and the omega-3s in chia seeds can help reduce inflammation, enhance cognitive performance and reduce high cholesterol. In addition, chia seeds are also high in fiber, and contain 18 percent of the daily recommended intake of calcium. good fats, complex carbohydrates and whole grain foods and consume organic products when possible. This month focuses on ambition. You should always ambitiously take care of your mental health. The Optimist Creed may help to remind you of that. I promise to be so strong that nothing can disturb my peace of mind. I promise to talk health, happiness and prosperity to every person I meet. I promise to make all my friends feel that there is something in them. I promise to look at the sunny side of everything and make my optimism come true. I promise to think only the best, work only for the best and to expect only the best. I promise to be as enthusiastic about the success of others as I am about my own. I promise to forget the mistakes of the past and press on to great achievements of the future. I promise to wear a cheerful countenance at all times and give every living creature I meet a smile. I promise to give so much time to the improvement of myself that I have no time to criticize others. I promise to be too large for worry, too noble for anger, too strong for fear, and too happy to permit the presence of trouble.